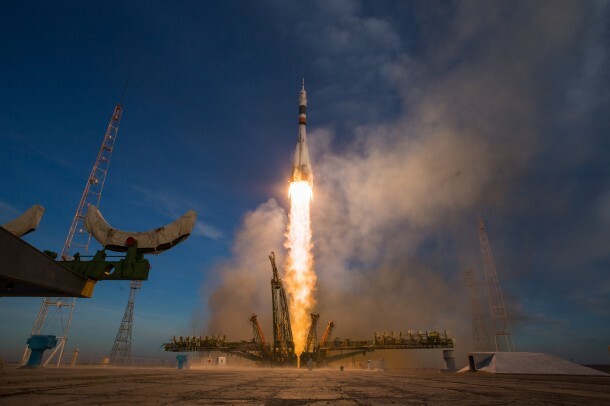 Three crew members are adjusting to life on the International Space Station after a successful launch and docking of their Russian Soyuz MS-11 spacecraft Monday. The Soyuz carrying Anne McClain of NASA, David Saint-Jacques of the Canadian Space Agency, and Oleg Konenenko of Roscosmos launched at 6:31 a.m. EST (5:31 p.m. Baikonur time) from the Baikonur Cosmodrome in Kazakhstan. McClain, Saint-Jacques and Konenenko docked to the space station’s Poisk module at 12:33 p.m. after a four-orbit, six-hour journey, and opened the hatch between the two spacecraft at 2:37 p.m. The arrival briefly restores the station’s crew complement to six as they join Serena Auñón-Chancellor of NASA, Expedition 57 Commander Alexander Gerst of ESA (European Space Agency) and Sergey Prokopyev of the Russian space agency Roscosmos. Auñón-Chancellor, Gerst and Prokopyev are scheduled to remain aboard the station until Dec. 20. Expedition 58 officially begins once the three departing spacefarers undock from the space station. McClain, Saint-Jacques and Konenenko will spend more than six months conducting hundreds of science investigations in fields such as biology, Earth science, human research, physical sciences and technology development, providing the foundation for continuing human spaceflight beyond low-Earth orbit to the Moon and Mars. Some of the investigations they will conduct are sponsored by the U.S. National Laboratory on the space station, which Congress designated in 2005 to maximize its use for improving quality of life on Earth. Highlights of upcoming investigations include experiments in forest observation, robotic refueling, and satellite deployment. The crew is scheduled to be onboard during the first test flights of NASA’s Commercial Crew Program, which will return human spaceflight launches to U.S. soil. In March, the station will again return to a full complement of six crew members when they are joined for Expedition 59 by NASA astronauts Nick Hague and Christina Koch and Alexey Ovchinin of Roscosmos. This is the first spaceflight for both McClain and Saint-Jacques and the fourth trip to the space station for Kononenko. McClain, a native of Spokane, Washington, is a lieutenant colonel in the U.S. Army. As a senior army aviator, she has logged more than 2,000 hours in 20 different rotary and fixed-wing aircraft. She earned a bachelor’s degree in mechanical and aeronautical engineering from the U.S. Military Academy at West Point. She earned a master’s degree in aerospace engineering from the University of Bath, England, and a master’s degree in international relations from the University of Bristol, also in England. For more than 18 years, humans have lived and worked continuously aboard the station, advancing scientific knowledge and demonstrating new technologies, making research breakthroughs not possible on Earth that will enable long-duration human and robotic exploration to the Moon and Mars. A global endeavor, more than 200 people from 18 countries have visited the unique microgravity laboratory that has hosted more than 2,500 research investigations from researchers in 106 countries.